Since it's been revealed that Apple chose to use a soldered down, non-removable SSD in its 13-inch and 15-inch Touch Bar MacBook Pros, it's natural for users to wonder about the fate of their data in the event of a fault that requires a logic board replacement. Fortunately it appears as if Apple has a proprietary in-house tool to rescue stored user data when disaster strikes. 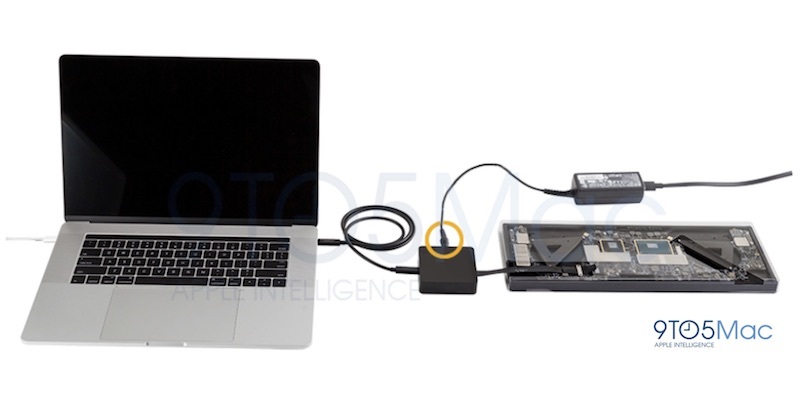 9to5Mac reports that a dedicated port on the logic board allows Apple staff to attach the recovery tool once the board's been removed from the chassis. The tool then transfers the data from the SSD to a working MacBook Pro's drive via one of its USB-C ports. All indications are that users won't be able to get their hands on this recovery tool, as it's only available to Apple support staff for emergency use when a laptop sent in for repair won't boot. This is purely speculation but I'd wager Apple would do this for free if you were out of warranty - it's their own fault for soldering down the SSD. Don't hold your breath on that. If anything Apple does, they are not going to give away a service for free out of warranty ( iPhone 6 touch disease). All i see here is a money making machine for apple. You all have fun with that!!! Bs. I almost guarantee Apple will do it for free. I've taken out of warranty stuff to Apple to be fixed to an Apple Store. If they can fix something without cost to them other than labor they will usually do it. Not BS. I too have had out of warranty work done for free by Apple. I have also been denied free out of warranty service by Apple. It's not their policy. It depends on the type of work and more importantly... scratch that, MOST importantly the employee in the store. Luck of the draw is not something I'd use to base a guarantee on for out of warranty service. The touch disease only happens to phones dropped too hard. This is BS. It's the same BS as the ubiquitous "a small number of customers have experienced..." PR line Apple trots out whenever there are issues. Touch disease wasn't about the phone being dropped too hard. Anyone believing that line really needs their head checked. That's a sad example of blame the customer for a design defect (which they promptly fixed in the next iPhone iteration). The same as any other logic board component failure. A dead SSD should mean a simple replacement of the SSD, not the entire board. Soldering the SSD to the board makes this recovery tool and the "port to nowhere" necessary. Also it eliminates the possibility of upgrading your SSD down the road. Well then, they shouldn't have made the SSD soldered. Another reason among the many not to buy any of their new crippled Macbooks. Note that there are also situations where the computer does not boot anymore but TB target disk mode might still work. And this crap is the reason I don't use macs. Love iOS but Mac OS. Meh. Because one can change the SSD inside iOS devices? Think about this with an open mind. There is nothing special about the SSD. It isn't any more prone to fail than the other components. In the old days CPUs were socketed. Now they're not. Your desire to make the SSD replaceable is arbitrary. On the 2015 rMBP if the logic board failed you could simply replace the old SSD with the data in tact, saving money and saving waste on a perfectly good SSD. • The very "un-green" aspect of binning said perfect SSD by a company that professes to be so "green". No one has said why it benefits soldering the SSD in the rMBP except if the machine was dropped and the SSD was dislodged but then there would be almost certainly other problems. I just don't buy the "thinness" argument either. I can only see negatives here by apple, no positives at all just poor excuses like the title of this thread, and "thinness". I'm glad apple isn't a Vogue model their ridiculous obsession with thinness would put folks OFF.....actually this is happening - read the posts folks are NOT happy. so repairable and easily upgradeable!